FANBOY PLANET.com . : cg-fallscount08232010 :. ...though the haircut covers it up. Welcome to Falls Count Anywhere! My name is Chris and this proves my point! 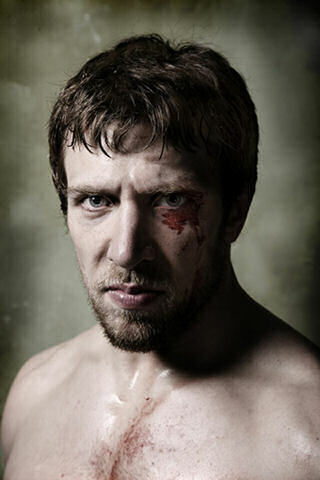 Bryan Danielson is Daniel Bryan once again and he’s got a tough road ahead of him. The Franchise Tim Davis said for everyone to mark him that Daniel Bryan will be a household name sooner than later, and while I think he could be, I do think he’s got a few things he’s gotta overcome. Bryan was working indies, happy as a clam. He was fired for choking Justin Roberts with his necktie, something that a suit in the NBC hierarchy thought was far too violent for the current PG direction of the company. This led to him setting up his website and taking indy dates. Some folks noticed that after September, his dates got a lot more limited and that had people talking. His was the name that I kept hearing connected to the Florida start-up that’s been signing people left and right. He was also the guy I’d heard that RoH was planning on bringing in for TV tapings after his 90 day no compete clause ran out. Apparently this was not the case. The idea that Bryan would return to the WWE had been out there all along. A lot of folks saw it as a part of the booking plan that Bryan would come back, upset that the Nexus had kicked him out for feeling remorse, which was the storyline reason for him going away. Doing it like that screamed angle, but a lot of folks who should know, including at least two people in the WWE who I talked to at the most recent San Jose tapings, all said that he was legit fired. It is likely that this was the case and that they saw good money in bringing him back. No word on how the ‘suit’ at NBC who called for his firing felt about it. SummerSlam wasn’t a great show. It was an OK show, a couple of decent matches, a pretty good angle with Nexus to end the Dolph Zigler vs. Kofi Kingston match and an ending to the Main Event that had a lot of people talking and just made sense to me. They did an angle where they had The Miz say that he was going to be on the team to replace the injured Great Khali, but instead he ended up being dropped by John Cena in favor of Daniel Bryan. The WWE had put the word out earlier a couple of ways. They made an announcement on their Twitter (which I managed to see), and they were confiscating signs mentioning Bryan at the door (which I did not see). This is the kind of stuff that may actually be helpful as they did it as the show was going on, which may have helped the replay value for that night. Bryan eliminated a couple of guys, including Heath Slater who looked really good in the match, and then was taken out when Miz came out and hit him with his briefcase. That led to him getting eliminated. It is possible that he was put over harder than anyone not named John Cena. Bryan was certainly the star, though he came out to almost no pop on Monday, which was sad. Cena, by the way, was made out to be Superman, surviving the DDT on the concrete and then coming back to eliminate both Justin Gabriel and Wade Barrett. He was made the star and people complained that they had blown the entire Nexus angle by having them lose the match. I disagree because 1) they’ve done the ‘beat on John Cena’ thing to death and 2) the Nexus thing needs to come to a quicker end so that they can incorporate the second season NXT guys into the fold. The best way to do that happened on RAW where they kicked out one guy through a series of Nexus vs. WWE matches. There are only so many spots and they could do far worse than ending the Cena & Co. vs. Nexus feud and have them defending their spots against the second season Nexus crew. That would be interesting and keep a few of them employed a little longer. Besides, I really like Percy Watkins on NXT. Bryan has an up-hill battle. He’s not big, so the top team won’t fight for him, but he’s also an excellent worker in a style that HHH has said is lame, so they’ll be jobbing him to guys who ‘understand main event’ style. That’s always a hard thing. It’s possible that he’ll become the next Chris Benoit, do a period of jobbing where he manages to get over and then he becomes a star. That would work for him, I think. The real problem is there are no more Jobbers. There aren’t those guys whose sole job it is to laydown and put over the upper card guys and their finishers. I understand that it reeks of Old Skool, but it works to show the public ‘Hey, these guys are good!’ and they should start to get back to that at least a little. It helps to get the crowd into the top matches and it protects the stars. What would work for Daniel Bryan is to have him work a 3 or 4 minute match, get his win and then they run an angle with The Miz after. That’s better than having him job to an NXT guy with a distraction like they had on Raw. Still, I think Daniel Bryan is gonna be big, but it’s gonna take some doing. In other news, Lance Cade, the Shawn Michaels-trained former star who was best remembered for the team he had with Trevor Murdoch, passed away. He’s one of those WWE stories that they wish would go away. He had the look, he had the size, he was a decent enough worker and had a decent promo, but he was also a heavy partier and was fired once for getting so messed up on a flight that he had a seizure. He was re-signed and then did rehab and after he went through it, they cut him. He was said to have been in very bad shape the last week of his life. There are plenty of folks who would have had him on their Deadpool for ages because he was far too out of control. He was only 29. That’s all for this week! More later!